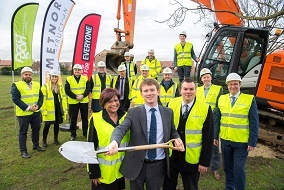 Last week, the start of construction on the new centre in Harrow Lodge Park, saw a silver spade groundbreaking event take place on-site to mark the first milestone of the development. The new facilities are being delivered by Havering Council, working in partnership with Everyone Active, who manage the Council’s leisure centres. It is part of a huge investment in leisure and sport facilities by the Council, including Sapphire Ice & Leisure in Romford, which has just celebrated its first anniversary. During the first year, the centre in Romford had over half a million visitors. The Council has also pumped money into refurbishing Central Park Leisure Centre, Harold Hill and further options for leisure facilities are being looked at, as part of the regeneration work taking place across the borough. While construction takes place on the new complex in Hornchurch, the current centre will be open as usual to residents and visitors, right up until the grand opening of the new centre in 2020. At the new centre, residents will be able to enjoy a 25m eight-lane swimming pool, a 20m wide learning and diving pool with movable floor to change the depth, a 100+ station health and fitness suite, three exercise studios and top-class changing facilities. Councillor Damian White, Leader of Havering Council, said: “This event marks the first step in a very exciting journey that will see a brand new leisure facility for our residents. “We’re pleased to be working alongside Havering Council, Paragon and Metnor to bring such an exciting facility to the people of Havering.